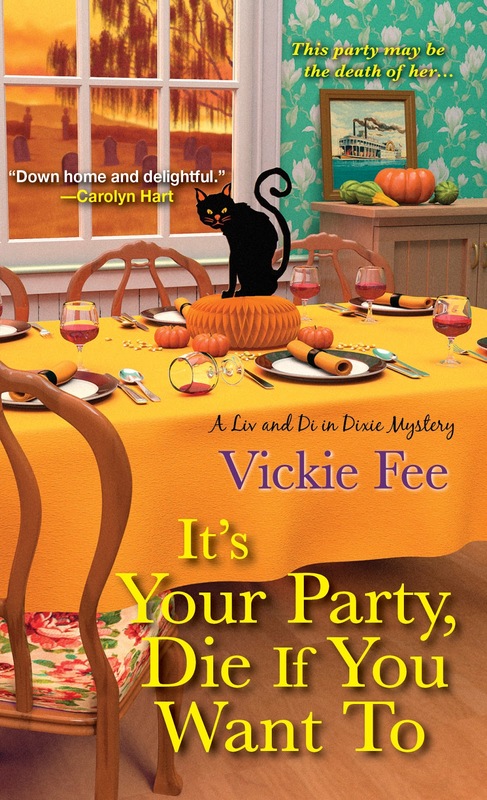 Vickie Fee is the author of the Liv and Di in Dixie mystery series. She blesses hearts and makes Jack Daniels whiskey balls that’ll scorch your tonsils. She’s a fellow member with me of both the Guppy Chapter of Sisters in Crime and the Upper Peninsula Publishers and Authors Association. Usually it’s just the whir of the air conditioner in the summer and the popping sounds of the radiant heater in the winter. I’ll resort to instrumental music if the neighbors’ voices start competing with the voices in my head. Terror in Taffeta by fab cozy author Marla Cooper. Because: It’s a fun and well-plotted mystery. And I had been on lockdown most of the summer trying to finish my own manuscript for Book 3 in the Liv and Di in Dixie series, so it was great to read just for enjoyment again. Plus, I had the privilege of hanging out a bit with Marla at Malice Domestic earlier this year and knew she was a lot of fun. I’m a pantser by nature. But once I reach critical mass in the manuscript and have all the big pieces, then I work on a detailed outline/timeline, figuring out where everything goes, moving scenes around and filling in the gaps. I used to finish every book I started. But now that I write novels I don’t have nearly as much time to read them. If I’m not hooked on the story or the characters by some point in the second chapter, I let it go and move on to the next book on my teetering To Be Read pile. Yes – I can’t help myself! The good ones offer encouragement to counterbalance all those nagging self-doubts writers have. But even the less than stellar reviews can be instructive. If there’s thoughtful criticism, I pay attention to that. I write a bit short – that’s because I don’t write the book in order. I write the big scenes first for the main plot, then the main subplot. Once all the big pieces are in place, I do a detailed outline and go back and fill in the plot holes, write transitional scenes and finally sprinkle in finishing touches of additional description and punch up dialogue here and there. The murder in this book happens at a retreat center during the annual Dixie businesswomen’s retreat, and includes an excursion with a celebrity ghost hunter into a small family cemetery behind the lodge. This part of the book is actually drawn from a real life experience! The Memphis chapter of Sisters in Crime held an annual writer’s retreat each October at a retreat center very similar to the one described in the book, including the family plot. One year we invited some paranormal investigators who brought along their ghost-detecting equipment, and we all traipsed through the little cemetery out back! Have the courage to admit to yourself when a manuscript is beyond repair. Let it go and start a new novel. Before I got a book deal, I spent way too much time on my first two seriously flawed manuscripts, trying to convince myself they could be saved. 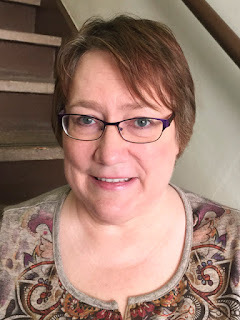 I finally buried them in the backyard where they belonged – and Manuscript #3 turned out to be the one that landed the agent and the publishing deal. 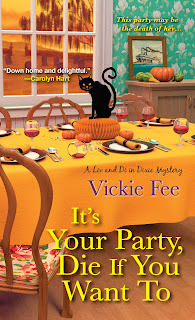 To connect with Vickie and learn more about her books, visit www.vickiefee.com or find her at www.facebook.com/VickieFeeAuthor and on Twitter: @vickiefeeauthor. Jim, the interview was fun. Thanks for letting me hang out on your blog today! The pleasure was mine, Vicki. Best of luck on the book's launch. I blame Bouchercon for being late to this party, but I really enjoyed your interview!